Having an alcoholic friend is never easy, especially when it comes to convincing him or her to enter drug and alcohol rehab. But as a good friend, you should do your best to convince him or her to take plunge. It’s a two-part challenge, first convincing him or her to get help in the first place, and then helping them to be prepared to enter drug or alcohol addiction rehab centers. There are times that you are frustrated with the behavior of a pal who has been addicted to drug or alcohol, and it is very hard to show any sympathy or love. You might tell them bluntly that they need to go to a best drug or alcohol addiction rehab centers and start their recovery, but this action will just fail and might even cause your alcoholic or addicted loved one to retreat from you and sink even further into addiction and depression. Confronting them assertively may help, but you should tread carefully because they might interpret your actions as a threat. Be sure to let them know how much you care about them and how worried you are about their bad behavior. This approach may be more convincing in the long run. 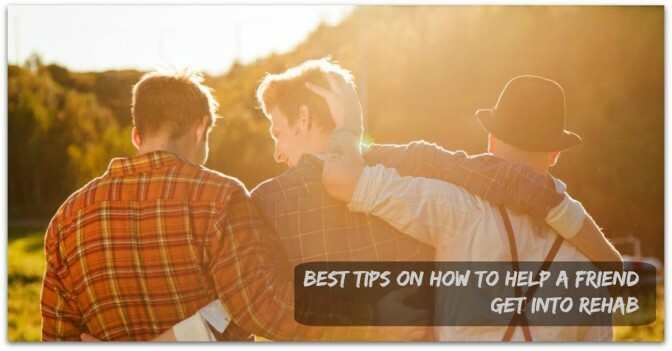 As a friend, you always know the best way to comfort your buddy, and a good rule to follow is to offer your time and effort, but no financial aid, because it may go toward feeding their addiction. Let them know you can assist them with anything that has to do with getting them to rehab or improving their lives. Draw the line at providing them money. Individuals who are addicted to drugs and alcohol rarely admit that they have a problem because they don’t want to believe that there’s anything wrong with them. But if they’re going to get into drug rehab addiction recovery, they must first accept that the problem exists. You can help coax them out of their by politely pointing out how their behavior has created problems for themselves and for other people. If your friend’s health has been affected by their addiction, tell them about that as well. What else can you do to support your friend prepare for drug addiction rehab centers? Once your friend admits that he or she has an addiction problem and that he/she is willing to enter drug rehab, you must move on to the second stage: Supporting them prepare for drug rehab. It takes a lot of courage to seek addiction treatment and your loved one will undergo a lot of pain and distress before reaching that point. So acknowledge to your buddy that he or she has been through a lot, and continue to be caring about them while they are so vulnerable. Your continual support them will mean a lot to them. There are chances that your loved one’s addiction is accompanied by another mental illness like depression or anxiety. You can aid them find a treatment professional or therapist that can give them a proper diagnosis, in order for them to find the right type of drug addiction rehab centers. Finding the right drug rehab for your loved ones may be difficult. You can support your friend by researching addiction rehab centers in New York, and finding one that is comfortable for them, and will provide the best treatment.